Located on the west coast of the Andaman Sea, Phuket is the largest island in Thailand. With magnificent coastal scenery, Phuket is characterised by tropical rainforests, steep limestone cliffs, and picturesque beaches of soft golden sand. 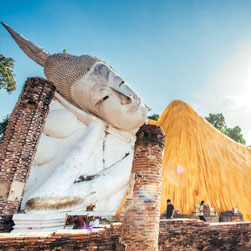 With a wide range of activities from beach lounging and watersports to culture and history and holistic healing, it is no surprise why Phuket is one of the most popular beach destinations in Thailand. There are hundreds of flights daily from domestic and international destinations into Phuket International Airport.